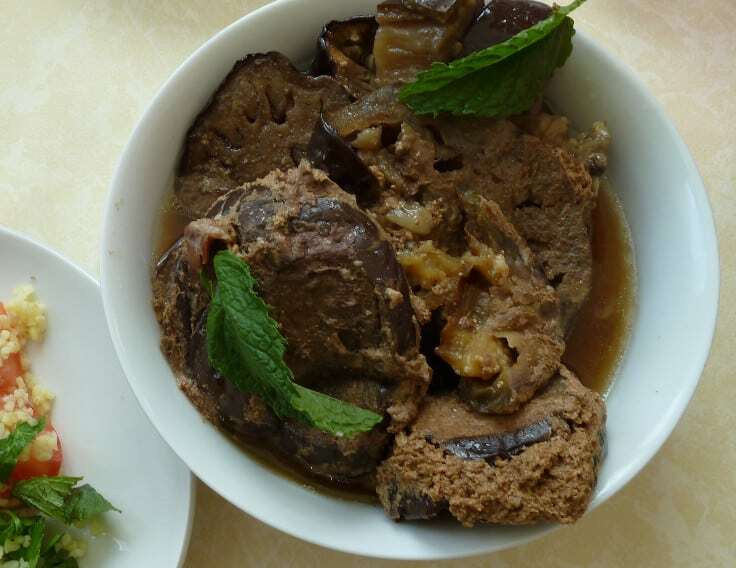 This spiced slow cooker lamb roast is the perfect fusion of middle eastern cuisine and a good old British roast. 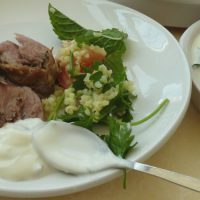 You can serve the meat with roast potatoes or middle eastern sides. Even better, it cooks in the slow cooker with no added liquid and minimal preparation. It’s fragrantly spiced, and oh so moist. Don’t you have better things to do than cook when it’s warm? We really enjoyed getting out walking in the country on our recent holiday to the lake district. As it was lovely weather yesterday we escaped to the magnificent Dalby Forest (I love living in Yorkshire!) for a fantastic walk. We came home to a beautifully fragrant house, and a roast dinner with a difference that was really easy to get to the table – the sides were already prepped in the fridge. Now, you could serve this slow cooker lamb roast with roast potatoes, stuffing and traditional veggies. The juices would make an amazing gravy! However, we decided to go all out middle eastern and served it with tabbouleh and pitta bread. You could add olives, hummus and falafel for a proper feast. We cooked the joint for a full 8 hours, which meant we could have a good long day out. It also meant it could have been carved with a spoon. When I have the chance I’ll experiment to find the perfect sliceable cooking time. You’d think aubergines (eggplant) wouldn’t suit the slow cooker, and they do come out a bit mushy, but oh the flavour! If appearances really matter to you you could blend the eggplant/aubergines to make another sauce. They really do soak up the flavour, and produce liquid to keep the lamb nice and moist. This slow cooker lamb roast should serve around 8. As there are only three of us and most of this roast will be going in the freezer, I made enough minted yogurt to serve around four. You could easily multiply it up, or reduce the marinade down. I haven’t included the marinading time in the prep time as it isn’t active preparation time. 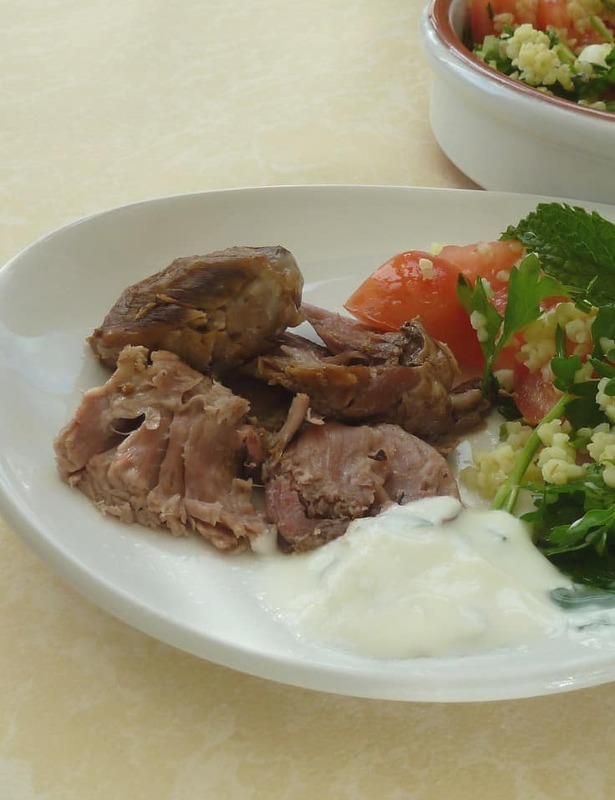 It helps to use fairly thick yogurt, so it sticks to the lamb nicely. I’ve used a home made full fat yogurt, but a low fat thick or greek yogurt should be just as yummy. The night before, mix together the marinade ingredients. If your slow cooker has a removable dish, place the meat into it and cover evenly with the marinade. Otherwise, use another large dish. When the meat is covered refridgerate it overnight. The next morning take the dish out of the fridge. If necessary transfer the meat to the slow cooker. Slice the aubergine thickly, 1-2 cm (nearly an inch) per slice. Place them in the slow cooker underneath the joint. Cook on low for 8 hours, and enjoy. Strip the mint leaves from the stems and chop or tear them as fine as you can. Stir the mint and sugar into the yogurt. Let stand in the fridge to infuse the flavour if you can. 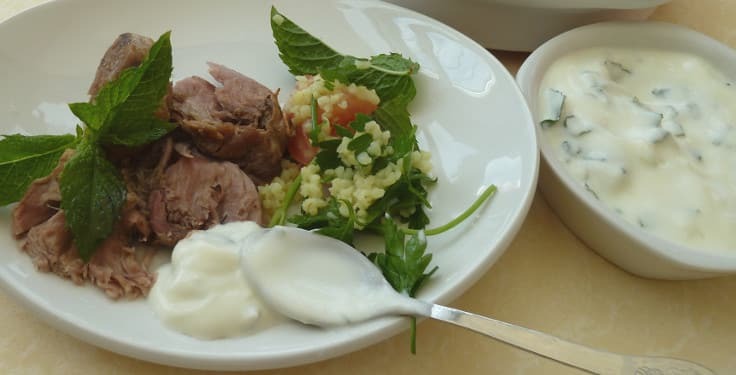 Love lamb and yogurt. I usually cook it over the barbeque. This is a nice alternative and it is nice to have your meal ready after a good walk. Yum! Such a wonderful comfort meal. I love the additions of all of those spices and the mint yogurt. So delicious. Love the idea of using the same recipe but totally different tastes resulting from it!